The aim of this article is to report the treatment outcomes, toxicities, and dosimetric feasibility of our simultaneous-boost intensity-modulated radiotherapy (SIB-IMRT) protocol. Thirteen patients with malignant gliomas treated between December 2000 and September 2004 were enrolled in this study. Two planning target volumes (PTVs) were defined in the present study. Our IMRT regimen delivered 70 Gy/28 fractions (fr)/daily; 2.5 Gy to the gross tumor volume (GTV) with a 0.5-cm margin, defined as the PTV-G, and 56 Gy/28 fr/daily, with 2.0 Gy to the surrounding edema, defined as the planning target volume annulus (PTV-a). Eleven of the 13 patients received one or two courses of nimustine hydrochloride (ACNU) (100 mg/m2) and vincristine (1.2 mg/body) and interferon-β (3 × 106 units) three times weekly during the period of radiotherapy. Adjuvant chemotherapy, ACNU (100 mg/m2) and vincristine (1.2 mg/body), was repeated every 6 weeks and interferon-β was repeated every 2 weeks. The treatment outcomes, toxicity, and dosimetric feasibility were assessed. All the patients experienced tumor recurrence. The median progression-free survival times for patients with grade III tumors and glioblastome were 7.5 and 8.0 months, respectively. The 1-year and 2-year overall survival rates for all the patients were 77% and 31%, respectively. Four patients experienced acute grade 1/2 toxicities during the treatment. 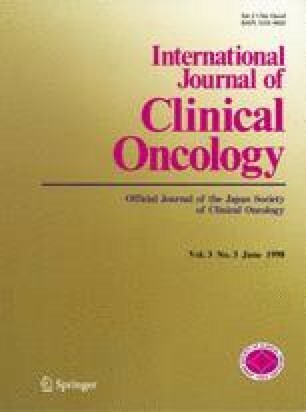 No late toxicity related to radiotherapy has been seen. Analyses with dose-volume histograms confirmed excellent conformity of dose distributions in the two target volumes, PTV-G and PTV-a, with the sparing of organs at risk. Our IMRT regimen did not prevent tumor progression. However, the ability of IMRT to deliver highly conformative doses to two contiguous targets, GTV and the surrounding edema, justifies its application to malignant gliomas.